You know those people that make homemade granola bars and energy bites every week to have on hand…I admire you. I want to do that. 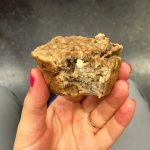 Not because I think I need to snack on homemade things (the convenience of a wrapped bar is just….fab) but because baking for me, is very therapeutic and I love turning on a podcast and tearing up my kitchen with peanut butter, oats and sugar. I might not be making homemade granola bars, but the most consistent thing in my life currently is a weekly batch of banana bread. I buy bananas in bulk for the sole purpose of watching them become super spotty by Saturday. I’ve also come to realize…that just because I don’t have time to press granola into a pan, bake, cut into uniform slices and wrap in foil to be stored in the freezing for homemade snacking, my often last minute thinking and anti-uniformed life can jive with throwing a batch of granola on a sheet pan. No symmetrical cutting involved. 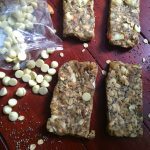 There are those that thrive off structure and routine and symmetrical homemade granola bars. And there are those that flourish with what we will call….scattered, yet functional disorganization. That is where granola comes in. 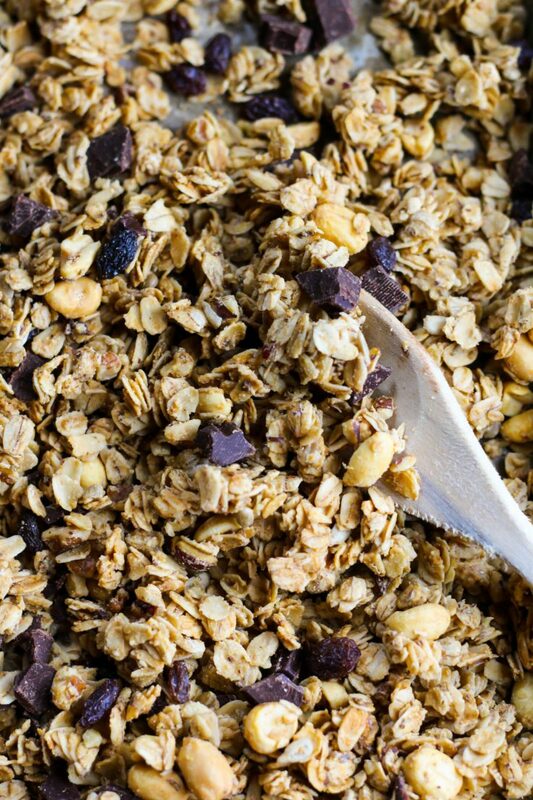 Because a granola cluster is just that. Scattered and yet cohesive all at once. Am I making any sense by now? Okay. Let’s just keep going. Whenever I bake, it’s usually some combination of chocolate, peanut butter and banana. I like fruit crisps and vanilla cake…but I also find myself puling out the chocolate chips and jar of pb. Sometimes just chocolate as in a chewy (never crispy) chocolate chip cookie or fudgy (never cakey) brownie. Sometimes its peanut butter, flour and banana for a doughy batch of banana bread. 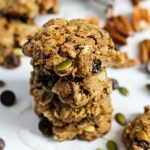 And sometimes it’s the classic combination of chocolate and peanut butter with some oats mixed in to yield a promising batch of chewy, yet crispy granola. That is this recipe. Pour it over yogurt with sliced banana for breakfast. Toss a handful into a bag of boring almonds for a satisfying snack. Spoon some onto ice cream or onto your morning oatmeal. Whatever you do, just make a double batch. It goes quick. Before I leave you will the recipe…toss some coconut in during the last 10 minutes of baking along with the raisins and you won’t be mad you did. Then combine the oil, maple syrup, peanut butter, and salt in a bowl and microwave for 30 seconds. Stir mixture and microwave in 30 second intervals until the peanut butter is melted. Then combine the oats, flaxseed, peanuts, and sunflower seeds in a large bowl. Pour the wet ingredients into the dry ingredients and stir well until all the dry ingredients are coated. Pour onto a greased sheet pan in one even layer. 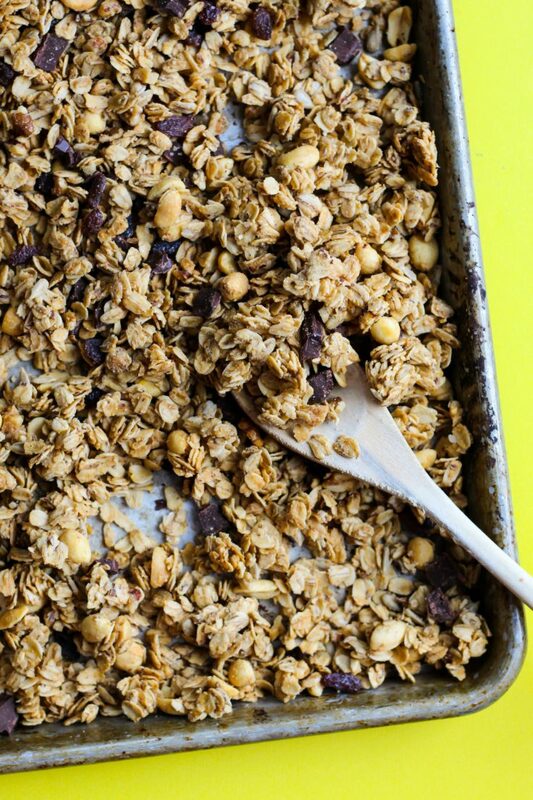 Bake granola for 35-40 minutes, stirring every 10 minutes. Watch to make sure it doesn’t burn! Let the granola cool completely. Then add in the chocolate chips and raisins and store in a ziploc bag. You had me at peanut butter and chocolate. I don’t know of may other combos that are better than that! Adding this to the every lengthening ‘must make sometime’ list! Thank yo for sharing!! Yes! PB + Chocolate is the best combo ever. I’ve been meaning to try out making homemade granola for forever, but always default and buy it at the store out of convenience. Definitely going to test out this recipe soon! WOW! Will def be baking this soon! Yum!! I’m with you on the granola over granola bar train. Every time I’ve attempted bars, they’ve fallen apart anyway, so I’ve given in to the scattered mess that is granola! My recipe always takes a bit of prep work involving my food processor, but it lasts me for two weeks of breakfast so it’s always worth it! 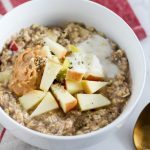 I look forward to throwing it over my overnight oats every morning and now look forward to breakfast even more than I ever did before! Oh my god, this may restart my granola addiction. Danger danger! But….can’t…..stop! :p Thanks for an awesome recipe! Just bought Nature’s Path pb choc granola this morning ought before reading this! But homemade…. yes please! that is SO GOOD too! I’m doing an overnight backpacking trip tomorrow and I think I may have to make this tonight for the trip. I’m sick to death of trail mix (the standard hiking snack) and I believe I have all the ingredients for this already! I hope it gave you tons of energy and your trip was a blast! I’d love to share since I get a lot of requests so look out for that this month!! it gives it a whole other texture!! I’m not the only one who makes a weekly batch of banana bread! It’s a grounding practice for me. It’s like, ‘whatever happens this week, at least I will have God and this loaf of banana bread’. 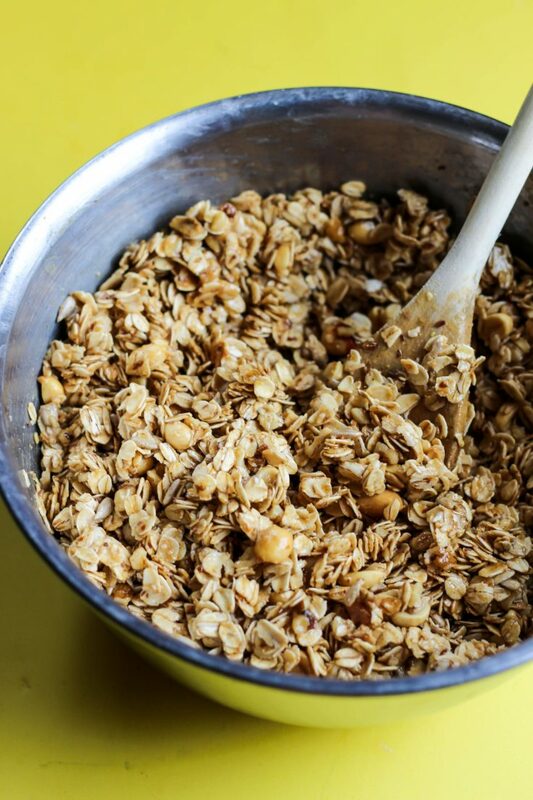 This granola looks super delicious–can’t wait to make and eat over yogurt. I love that phrase – “grounding practice” hope you love it! I love love love this! 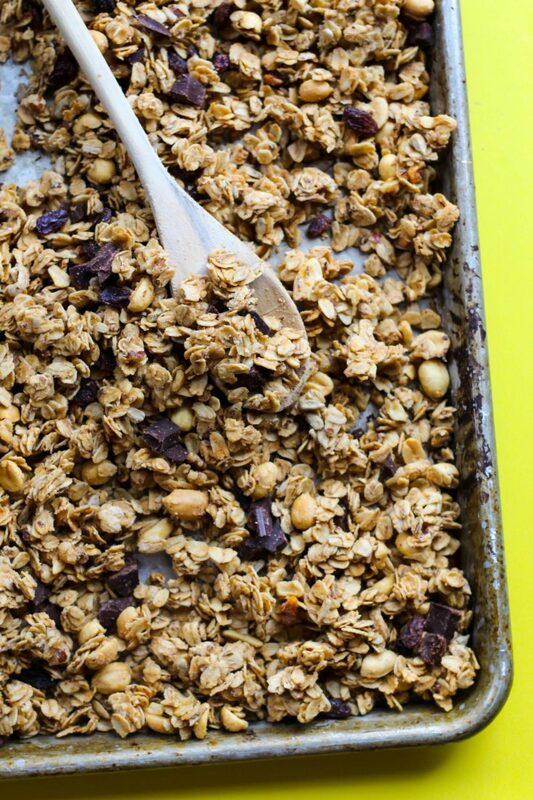 Peanut butter and chocolate is enough in and of itself, but then make it into granola and OMG!